Daily Illuminator: Go Get The Game Moop’s Monster Mashup, Ready To Be Reserved! July 5, 2016: Go Get The Game Moop’s Monster Mashup, Ready To Be Reserved! 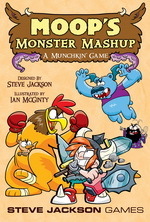 Actual aficionados can now acquire all the alliteration of our amazing activity, Moop's Monster Mashup, ahead of the average admirer.
. . . Well, that went ok.
What we mean is, fans can now preorder our upcoming Munchkin game, Moop's Monster Mashup, coming in July! Place an order with your friendly local game store, or reserve a copy on Warehouse 23. It's got all the puns and wordplay of other Munchkin games, plus the amazing art of Ian McGinty. Let the back of the box prove it: "The marvelous, mysterious, mixed-up magician Moop manufactured mashed-up monsters. Maybe the munchkins can massacre the mob of mortal menaces!" Kick down a door only to have a Fallrus drop down on you from above, tusks and all. Fight the Ghost Pepper, which is both a ghost and a pepper. Those Hot Cross Bunnies sure are angry, and on fire. Whatever you fight, don't forget to drink your Buff-alo Potion. Try on those Sockodiles. Pick up that Halbird; maybe it won't fly away before you use it. Moop, the mixed-up mage in the middle of the menagerie may be my new favorite Munchkin character. Don't miss out on owning all his crazy creations: preorder today!